Office Depot is offering FREE 5 lbs. 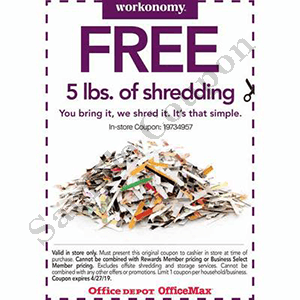 Paper Shredding April 14th – 27th Coupon can be found in the April 14th Ad. Valid in store only. Must present this original coupon to cashier in store at time of purchase. Cannot be combined with Rewards Member pricing or Business Select Member pricing. Excludes offsite shredding and storage services. Cannot be combined with any other offers or promotions. Limit 1 coupon per household/business. Coupon expires 4/27/19.